Fresh off a string of successes in 2016, the Roanoke Regional Partnership began a new five-year fund-raising campaign and a plan to focus on talent attraction among other elements to continue to grow the region’s economy in January 2017. The $3.3 million private-sector campaign, Accelerate 2022, kicked off today with the announcement that 47 investors already have contributed $2.48 million, or 75 percent of the $3.3 million private sector goal. In a presentation at the Vinton War Memorial, the public-private partnership, which includes eight regional municipalities and more than 200 businesses, outlined its plan to focus on attracting talent, engaging and developing regional leadership, further enhancing outdoor assets, inviting strategic investments, expanding marketing initiatives, and stimulating development to help regional communities and businesses compete and thrive. “The Partnership will leverage the success of the past five years to expand its work into new areas such as talent attraction to help grow the VTC innovation district,” added co-chair Victor Iannello, CEO of Radiant Physics. Talent solutions. Creating a dedicated talent attraction program that builds upon the region’s livability and connects with local college students. Targeted marketing. Strengthening marketing to position the Roanoke Region as an energized destination for business and talent. Leadership and engagement. Creating active, engaged leaders and citizens who advocate for the region. Asset development and outdoor branding. Ensuring the region has the product, amenities and systems in place to propel economic growth. “Our stakeholders and partners recognize the Partnership as collaborative, success-oriented and focused on results. We are seen as the go-to organization for advancing regional cooperation and thought leadership in shaping our region’s economic future,” said executive director Beth Doughty. The 2022 plan builds on the current program of work adopted in 2012 that took the region to a higher level, creating over the past five years 3,305 primary jobs, 3,459 secondary jobs, $501 million in investments, annual consumer expenditures of $192 million, an increase in per-capita income by nearly 12 percent and an increase in annual inquiry activity – contacts with companies and consultants – of 27.9 percent. All metrics met and most exceeded the benchmarks established in 2012. Through 2022, the Partnership is aiming for 3,367 new primary jobs, 3,821 new secondary jobs, $300 million in investment and another 12 percent increase in per-capita income. Major locations and expansion announcements over the past five years include Ply Gem, Ardagh Group, downtown Roanoke’s Hampton Inn, Altec, Yokohama Tire, Walmart Neighborhood Stores, Dynax, Wells Fargo, Fleetwood Homes, Arkay Packaging, Eldor Corp., Trinity Packaging, Virginia Community College System, Deschutes Brewery and Ballast Point Brewing and Spirits. In 2016, a banner year for the organization, the Partnership’s efforts led to an annual economic impact of $904 million, up from $148 million in 2015. 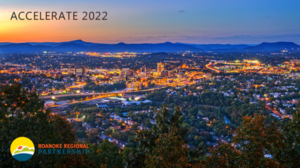 Since 1983, the Roanoke Regional Partnership has brought together the regional business community and governments in an economic development program that combines resources and strengths to attract people, jobs and investment. The Partnership represents Alleghany, Botetourt, Franklin, and Roanoke counties, the cities of Covington, Roanoke and Salem, and the town of Vinton.